Boeing today rolled out of its paint hangar the first 787-9 Dreamliner that will be delivered to Etihad Airways. 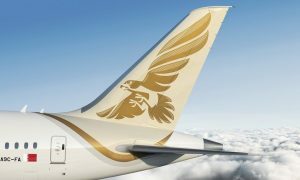 The airplane is painted in the airline’s new ‘Facets of Abu Dhabi’ livery with colors reminiscent of the desert landscape, inspired by the culture, Islamic design and architecture motifs of the United Arab Emirates. 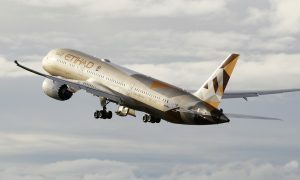 Etihad Airways, the national airline of the UAE, will take delivery of its first 787-9 later this year. Etihad Airways is one of the world’s largest customers for the 787 with a total of 71 Dreamliners on order, including 41 787-9s and 30 787-10s. 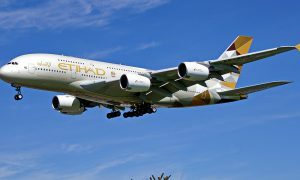 The 787 will be a key part of Etihad Airways’ fleet and network expansion plans. The airline has announced that the 787-9 will be introduced on six of the airline’s routes: Dusseldorf, Germany; Doha, Qatar; Washington, D.C.; Mumbai; Brisbane, Australia and Moscow.